Malaria is a common disease here. I can say everyone suffers from malaria several times a year. The worst outbreaks are during the rainy season which runs from July to October. Doctors say that mosquitoes benefit from the wet and dirty environment of the rainy season. And their numbers grow because they breed a lot at that time. We use traditional medicine to treat malaria. When a child is sick his parents, or the person who takes care of him, go to the bush to gather some of the leaves or roots of the trees we use to treat malaria. For instance, one of these remedies is the leaves of the Kossafounè, a local tree. We grind these leaves with water to obtain a bitter liquid, which is then mixed with some lemon juice. It is very effective against malaria. But I reckon that it is difficult to treat malaria. When you take the remedies you may feel well for a long time but the disease will eventually come back later. We also use modern medicine to fight malaria. Anyway, the result is the same: you will suffer from malaria whatever you do to treat it. In the dispensaries built by the government they give you a lot of tablets and injections. Children who are less than five years old and pregnant women benefit from free treatment against malaria in these governmental health centres. I think the reason is that children and women are more vulnerable. When you do a survey in my village, in every family you will find many cases of children suffering from malaria. From my point of view, malaria treatment should be free for everyone in these health centres because all Malians suffer from the disease. The cost of medical treatment is high for our incomes. This is why most people cannot afford modern medicine if they are sick. Instead they consult traditional healers who exist in every village. These healers didn’t study at school. Their knowledge is transmitted orally from generation to generation. Some of them learn their science from their parents, others learn from masters who are not their relatives. They heal physical and spiritual ailments. They are also oracles. Many rich and educated people and high ranking civil servants come from the capital, Bamako, and the big cities to consult village healers. Those who come are not all sick. Some are in search of good luck and opportunities to improve their income. Things are different when it comes to learning modern medicine. At first, you have to study at school for many years. Then you go to the university for many other years in order to study to be a doctor. Doctors are very important. They treat many diseases that traditional medicine cannot cure. They organise campaigns for vaccination against awful diseases like meningitis, polio and the rotavirus. Another disease that we get free modern medical treatment for is tuberculosis, which causes many deaths. For women modern medicine is particularly important. Doctors advise pregnant women to go frequently to the dispensary in order to receive directives to avoid complications during childbirth. There is no dispensary in my village. 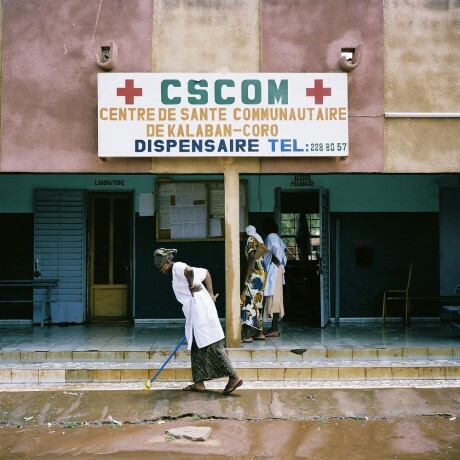 To speak to a doctor, pregnant women from my village have to go to the dispensary of Ouelessebougou, a town 7km away. These consultations help bring down the rate of maternal deaths and child deaths. As there is no dispensary in my village, in the past women gave birth at home, in their own houses. Many risks were linked to that, but women who are already in labour could not travel to another village to give birth. As a result, local NGO workers decided to help us. They built a small centre and trained some women in the village to take care of the women giving birth. Generally elder women who have gone past the age of having children themselves care for the women in labour. Now women don’t give birth at home, they do it in the centre built by the NGO workers. In case of a complicated childbirth, the trained women phone the dispensary in Ouelessebougou so that an ambulance can pick the woman up and take them there.